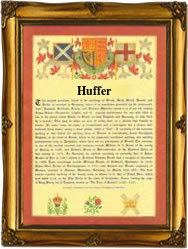 Recorded as Hufe, Huff, Huffa, Huffar, Huffer, Huffard, Huffin, Huffy, Houfe and others, this is an English surname. It is residential, and originates from the pre 7th century word 'hoh' literally meaning 'hell', but used here in a transferred sense to describe a projecting ridge of land or a hollow, and was originally given as a topographic name to someone who lived by such a natural feature. The surname was first recorded in the latter part of the 14th Century, (see below) and early examples of recordings taken from surviving rolls and registers include Thomas Hoofe in the Register of the Freeman of York City, and dated 1626, whilst on November 28th 1656, Katterne Houfe was christened at the church of St. John the Baptist, Chester, Cheshire. Other recordings taken from the church registers of the city of London include Jane Huffin who was christened at St Martins in the Field, Westminster, on December 11th 1631, James Huffey christened at St. Olave's Southwark, on November 14th 1661, and Mercy Huffer, who married Richard Matthews at St Andrews by the Wardrobe, on January 8th 1712. The first recorded spelling of the family name is shown to be that of William de Huff. This was dated 1379 in the Poll Tax returns of Yorkshire, during the reign of King Richard 11nd, known as Richard of Bordeaux, 1377 - 1399. Surnames became necessary when governments introduced personal taxation. In England this was sometimes known as the Poll Tax. Throughout the centuries, surnames in every country have continued to "develop" often leading to astonishing variants of the original spelling.